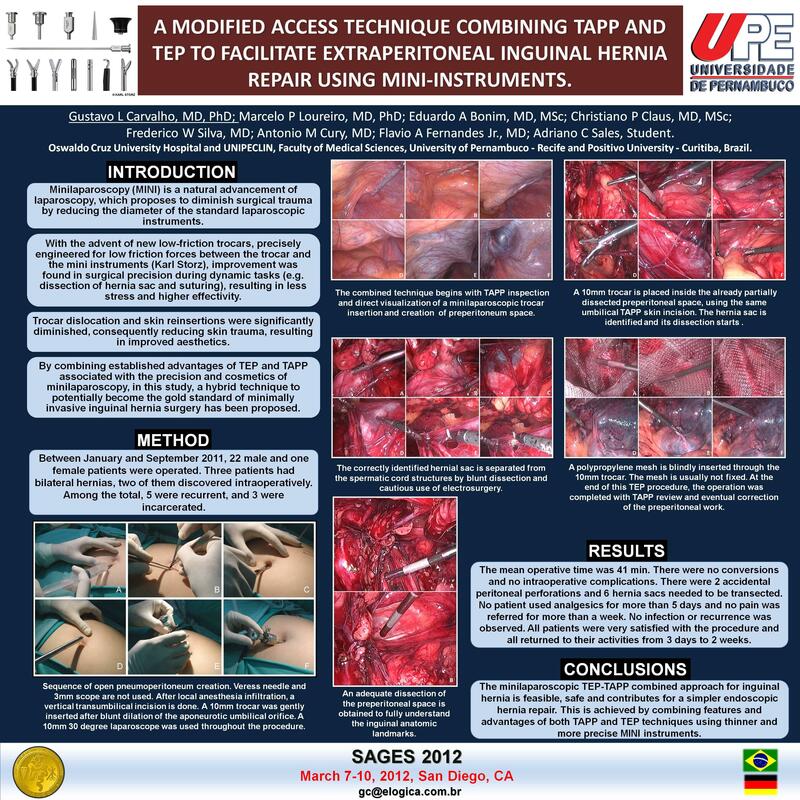 A Modified Access Technique Combining Tapp and Tep to Facilitate Extraperitoneal Inguinal Hernia Repair Using Mini-instruments. Gustavo L Carvalho, MD PhD, Marcelo P Loureiro, MD PhD, Eduardo A Bonim, MD MSc, Christiano P Claus, MD MSc, Frederico W Silva, MD, Antonio M Cury, MD, Flavio A Fernandes Jr., MD, Adriano C Sales, Student. Oswaldo Cruz University Hospital and UNIPECLIN, Faculty of Medical Sciences, University of Pernambuco – Recife and Positivo University – Curitiba, Brazil. INTRODUCTION: Endoscopic surgical repair of inguinal hernia is currently represented by two techniques: the totally extraperitoneal (TEP) and the transabdominal (TAPP) hernia repair. Although technically advantageous because of the option of no mesh fixation and no need for creation of peritoneal flap resulting in less postoperative pain and faster recovery, TEP has not achieved the popularity it deserves because of its complexity and longer learning curve. Minilaparoscopy (MINI) is a natural advancement of laparoscopy, which proposes to diminish surgical trauma by reducing the diameter of the standard laparoscopic instruments. With the advent of new low-friction trocars, precisely engineered for low friction forces between the trocar and the mini instruments, improvement was found in surgical precision during dynamic tasks (e.g. dissection of hernia sac), resulting in less stress and higher effectivity. Trocar dislocation and skin reinsertions were significantly diminished, consequently reducing skin trauma, resulting in improved aesthetics By combining established advantages of TEP and TAPP associated with the precision and cosmetics of minilaparoscopy, in this study, a hybrid technique to potentially become the gold standard of minimally invasive inguinal hernia surgery has been proposed. METHOD: Between January and September 2011, 22 male and one female patients were operated. Three patients had bilateral hernias, two of them discovered intraoperatively. Among the total, 5 were recurrent, and 3 were incarcerated. After local anesthesia infiltration, a vertical transumbilical incision is done. A 10mm trocar was gently inserted after blunt dilation of the aponeurotic umbilical orifice. A 10mm 30 degree laparoscope was used throughout the procedure. The combined technique began with TAPP inspection and direct visualization of a minilaparoscopic trocar dissection of preperitoneum space. It continued with a 10mm trocar placement inside the already partially dissected preperitoneal space, using the same umbilical TAPP skin incision. Minilaparoscopic retroperitoneal dissection was continued and at the end of this TEP procedure, the operation was completed with intraperitoneal review and eventual correction of the preperitoneal work. RESULTS:The mean operative time was 41 min. There were no conversions and no intraoperative complications. There were 2 accidental peritoneal perforations and 6 hernia sacs needed to be transected. Those defects were sutured laparoscopically at the end of the procedure, after proper TEP mesh accommodation. Small clinical irrelevant hematomas were found in 5 patients. One patient developed asymptomatic small hydrocele, partially regressed after 1 month. All patients were discharged within 19 hours, with analgesics on demand. No patient used analgesics for more than 5 days and no pain was referred for more than a week. No infection or recurrence was observed. All patients were very satisfied with the procedure and all returned to their activities from 3 days to 2 weeks. CONCLUSIONS: The minilaparoscopic TEP-TAPP combined approach for inguinal hernia is feasible, safe and contributes for a simpler endoscopic hernia repair. This is achieved by combining features and advantages of both TAPP and TEP techniques using thinner and more precise MINI instruments. Minilaparoscopic preperitoneal dissection allows faster and easier creation of the preperitoneal space for the TEP component of the procedure.